White painted (in the style of classic mime) faces in gender stereotypes of male and female, Louise Mothersole and Rebecca Biscuit greet us in white shirts and ties tucked into oversized white boxers. They exude an air of confidence and frivolity, dancing to the party music thumping in Summerhall’s lecture theatre. They wait until the audience is seated and then request the technician to play their track again, they dance and chat to each other and smilingly say ‘Sorry that was just for us, we’re going to go out and come back in now.’ This fierce yet friendly, devil-may-care attitude carries us through the next hour exploring women’s image, representation, social position and sexuality. 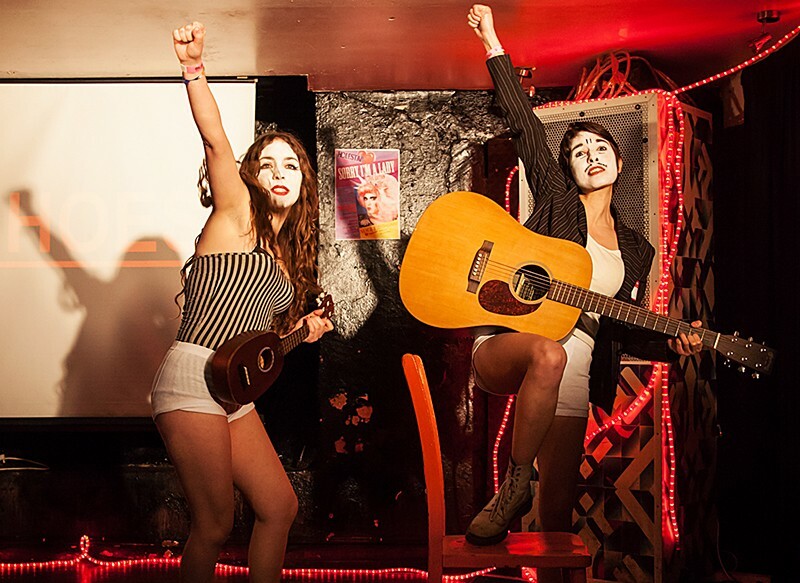 There is no doubt that these two performers, who were Total Theatre Best Newcomers in 2013, have vast ability to craft and entertain; they sing songs in soaring harmony, play guitar and ukulele and perform various brilliant bits of succinct choreography (a firm favourite sees them dancing through poses of male dominated sexual acts). They use these old-world, vaudeville like skills to deliver weighty political punches. The premise behind this show is a cynical leer at the tokenism of Radio 4’s programme: as they sing at the top of the show ‘It’s just one hour, out of 24… for women’. They begin with a dance to Mambo Number 5 and as each woman’s name is mentioned in the song, a name-sake female figure flashes up in digital projection behind them: deconstructing the ridiculousness of the ways women are portrayed in popular culture is their recurring theme. The projector is used to comic effect in this way throughout and an overall style of free-form cabaret and performance art develops. This medium really works for the company to throw a menagerie of ideas and images at their audience. Many facts are cited, statistics on women’s working wage and percentages of female representation at the Oscars are delivered. Quotes from female politicians and horribly airbrushed adverts are displayed for us. There is perhaps something here that slightly starts to lose me as we jump from one depressing fact to another, sing songs about shoes and undermine Miley Cyrus (a rather easy target, I begin to think). These are all terrible, horrible truths about the way that women are portrayed and the roles that we are still being asked to fulfil, but I long for some deeper response to this litany of prejudice. A glimmer of celebration, acknowledging the women in the world who are working and thriving with grit and pride, or a nod to the ways women operate within this forest of facts – the dark reality of what this can mean within the daily functioning of our lives. Perhaps it is simply a change in rhythm and build I need in order to grow some of these ideas and images and drive home their power to prompt action that the show seems clearly intended to inspire. Shocking and aggressively assertive as this piece is, and I celebrate and support that, stylistically, it falls just short of being truly transformative. I do however, feel stimulated throughout. These performers are wonderfully skilled and incredibly watchable, and I am excited to see a company who really want to say something and aren’t afraid to use their stage to shout. It is perhaps the excitement that this prospect generates in me that leaves me feeling slightly sold short. I would urge everybody to see this show, it is important, they are speaking truths, they are fun and brilliant and I’m very glad to see feminism fighting strong on stage. Here’s to pushing it even further. A London based performer and theatre-maker working mainly in devised theatre and interactive performance, Tara has also worked extensively with children and young people as a workshop facilitator, director and writer and is interested in theatre for the young at heart, immersive theatre and theatre clown. She has performed at numerous venues, including BAC and The Old Vic Tunnels, and is currently training full-time in Lecoq method at the London International School of Performing Arts.